This past weekend was annoyingly hot! So after a busy errand-running day on Saturday, I cooled myself down with a Grapefruit Cocktail while my mother sipped on an Orange Cocktail. And we identified them with colored fish stirrers! The combo of the citrus juices, lemon slices and muddled mint took the heat off my brow instantly. And just for kicks, a jigger of Coconut Rum was added to the mix! Muddle/crush some of the mint leaves at the bottom of your glass with a spoon. Add the ice cubes. 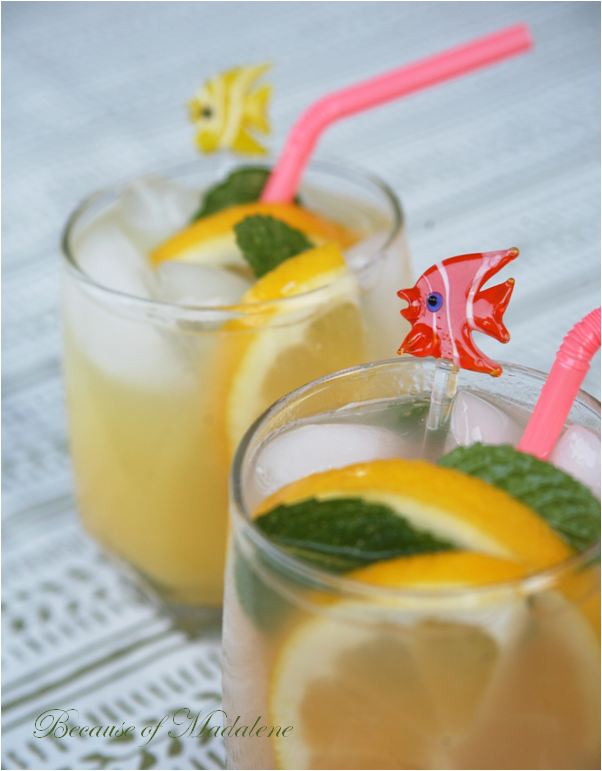 Pour in the coconut rum, citrus juice and Squirt. Add in the lemon slices and top it off with leftover mint leaves for garnish. These look so delicious and refreshing! Will have to give it a try. This sounds like a great drink for a pre-girl's night out event!